Next stop on this, our last day in the city, was the market. We wanted to buy spices and maybe some fabric - if any happened to catch my eye, that is. We jumped into a little old black and yellow taxi cab outside the station, then, and paid 50rps or so for the fun of another ride. These little black and yellow taxis are everywhere and with the meter starting at 22rps (25p) they are by far the easiest way to get about. Did I say there were plenty of them about? No sooner had we left the car and made our way across the road, we'd acquired another little friend. "Hello", he said, "I need to point out these market rules to you"
He pointed to the large handpainted sign on the wall by the entrance as a portly gentleman dressed in a well pressed, bright yellow linen shirt came over to shake our hands. As he did, he introduced himself as the Market Manager and offered his id tag, hanging around his neck. What did we want to buy? What could he show us? We did our best to say that we were really here to look around, to take photographs and yes, perhaps buy some spices, but no, we didn't really need (or want) his assistance, thank you. He pointed to the sentence on the sign about the requirement for a porter and then pointed to himself. He was to be our porter - and where should we begin? Upon thinking about it, that sentence seems to be along similar lines to "Dogs must be carried" but here we were with a willing and able porter with a numbered market badge around his neck - we simply did as we tend to do in India and just smiled and went with the flow. And so we wandered through the market, stopping to take photographs, enjoying the small details our friend was pointing out to us like this garlic and onion seller. What a job, eh, sitting peeling garlic cloves for a living? Here was the pineapple man, sitting in a shady spot carefully trimming and deseeding a pineapple. And here is the spice wala; the Spice King, no less. We had a list of spices we wanted to buy and our needs were soon taken care of by his eager assistant, who fetched and carried on demand. Each jar was opened for our inspection and approval, though after a while, one masala smelled the same as another! 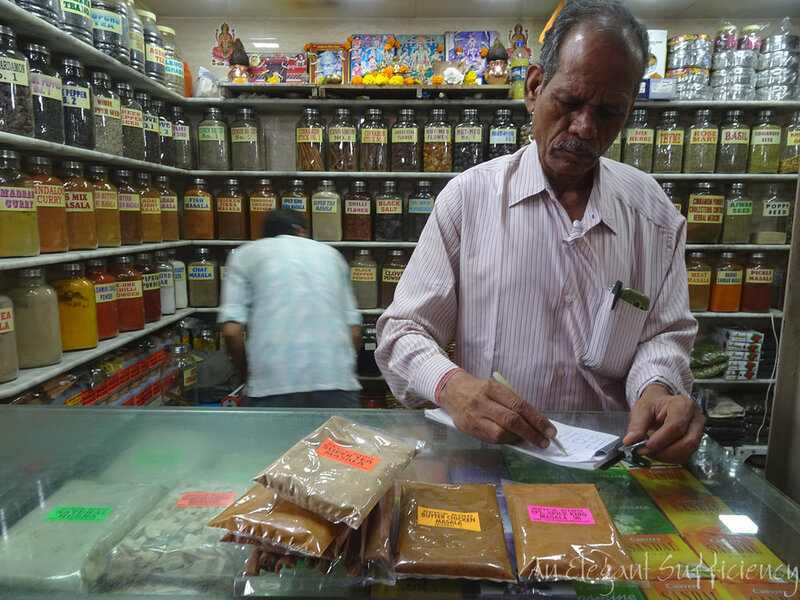 As we made our choices, the spices were bagged and labelled for us and calculations done. A timely text message from Amy and Edward sent the assistant scurrying around once more and with purchases packaged and complete, our yellow shirted friend had work to do in the form of two bags to carry. What else were we looking for, asked our porter. Well, I'd muttered about fabric and might have said something to my hero at that point, because in no time at all we were back across that road and being shown into a "pashmina showroom". Errrmmm....no thanks. There are times when one needs to be firm and resist the efforts of "helpful" people like this, so we thanked the Market Manager profusely, gave him a few rupees for his trouble and wished him a good day. Looking around him, my Hero also decided that he didn't need further market fun like this, so leaving me with the Indian purse, he skedaddled back to the hotel for an hour or two's peace and quiet. As for me? Well, I can't bear to miss out on a chance to buzz around somewhere like this, so I set off through the busy streets, with a vague idea of looking for a "spice dabba" in which to put our new collection of masala. 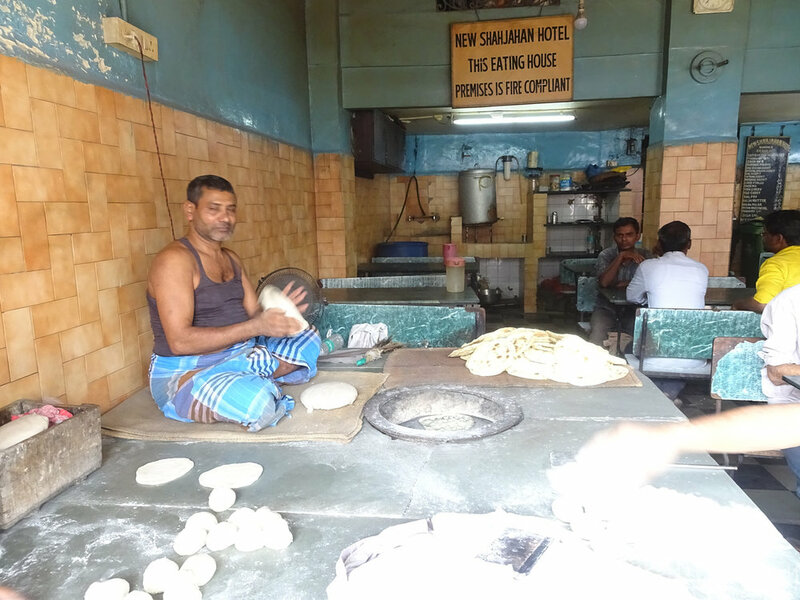 As I walked though, I came across this little café, where three men were making naan. I stood and watched them work, deftly shaping the dough, sitting crosslegged and working as a team in the hottest place imaginable! The chap doing the baking was placing the naan on the side of the oven and pointed out how quickly the bread baked. I wonder how many naan he makes a day? I seemed to have found myself on a street of perfume shops, each one with a display of ornamental bottles of oil. Not at all the kind of thing I was interested in, but just as I was about to give up and turn around, I spotted what looked like a promising sign hanging up there from the awning. Sure enough, Yusuf's small shop had a stock of every metal kitchen implement imaginable, mostly stored high into the ceiling of the tiny space. When I asked him for a masala dabba, he nodded and asked how many containers...would seven be good? As he asked the question, he produced a selection of different sizes from who knows where - there really was no space at all and yet it was all there at his fingertips. I agreed, seven was a good number - I'd take two. And how about a tiffin for Amy and Edward? Now he called upon his assistant to climb the ladder into the heights - how many containers, how big? Yet again, choices to be made. I agreed to buy the small, three container tiffin in his hand and the deal was done. Everything packaged nicely and a gift for me included: a small stainless steel water cup. Thank you Yusuf - my shopping was complete. Faced with the "megha choice" of goods around me, I decided that I too should head back. I spotted an elderly chap sitting in an equally elderly taxi by the side of the road and asked him to take me back to Apollo Bunder. Twenty minutes and eighty rupees later, I was back in the cool comfort of the Taj hotel - another world altogether.